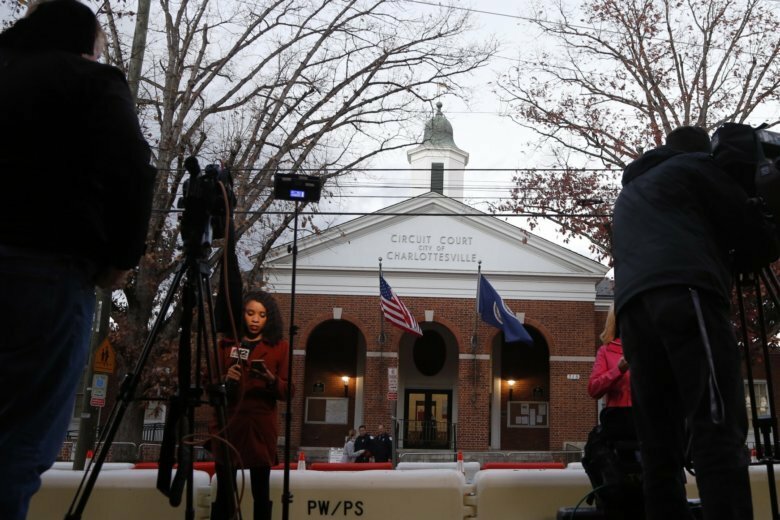 During opening statements Thursday in Field's first-degree murder trial in Charlottesville Circuit Court, defense attorney John Hill said Fields told a police officer after the fatal crash that he had "feared for his safety and was scared to death." WASHINGTON — One of the lawyers for the 21-year-old Ohio man charged with murder in the death of a woman during a white nationalist rally in Charlottesville, Virginia, last summer suggested James Alex Fields acted in self-defense when he drove his Dodge Challenger into a crowd of counterprotesters. Prosecutors countered that Fields came to Charlottesville for the “Unite the Right” rally full of anger and intentionally plowed his car into the crowd of people on 4th Street, killing 32-year-old Heather Heyer and seriously injuring several dozen others. Prosecutors, who must prove premeditation on Fields’ part, said jurors would see two Instagram posts from his account months before the crash, showing a car running into a crowd of people. “His actions before, during, and after the crash will give insight into the mind of Mr. Fields,” Antony told jurors. As for his claim of self defense to a police officer immediately after the crash, the prosecutors said jurors would be shown the officer’s body-worn camera “so you can judge his reaction,” and whether it’s credible, she said. The fatal Aug. 12, 2017 crash came after a series of violent clashes broke out on the streets of Charlottesville between white nationalists and counterprotesters. A report commissioned by the city later criticized the police response as ineffective. The intersection where the fatal crash occurred had been blocked off with only a plastic sawhorse. Both the prosecution and defense described the atmosphere in Charlottesville as tense and chaotic in the hours before the fatal crash. Hill said Fields participated in the rally but that, unlike other protesters and counterprotesters, he wasn’t armed or equipped with a helmet, face mask or sticks. Fields had driven overnight from Ohio before the rally, Hill said and had only brought a change of clothes — a white polo shirt and long khaki pants. Around the time of the crash, Hill said Fields had been “set upon by the counterprotesters,” who shattered his back window with bats and sticks and Fields thought he saw someone running with a handgun, the lawyer said. The trial in Charlottesville Circuit Court is expected to last several weeks. The 16-person jury — including four alternates — was seated Thursday just ahead of opening statements. The jury is made up 9 women and 7 men. Fifteen of the jurors are white; one is black. In addition to the first-degree murder charge, Fields has also been indicted on federal hate crime charges, which carry the possibility of the death penalty. One of the first witnesses called by prosecutors Thursday was a man whose image was captured in a dramatic photo as he was struck by Fields’ car. Marcus Martin became tearful several times while testifying, particularly when asked to describe Heather Heyer, a 32-year-old paralegal and civil rights activist who was killed when she was struck by Fields’ car. “She was just a great person,” Martin said, his voice cracking with emotion. Martin said he, his fiance, Heyer and another friend had just joined the group of counterprotesters when he heard a tire screech. He said he pushed his fiance out of the way, then he was hit by Fields’ car, suffering a broken leg and other injuries. “I really didn’t know what happened,” he said.